Glad you like these Peggi, they were taken on the Keighley and Worth Valley Railway (KWVR) in West Yorkshire quite close to where I live. This line was opened in 1867 serving the towns and woollen mills of the area until being closed by British Railways in 1962. After the closure a preservation society was formed and the KWVR branch was re-opene to passenger traffic in 1968. The KWVR has appeared in many television and film productions being most well known for it's role in the 1970 film addaptation of Edith Nesbit's The Railway Children. Most services on the line are opperated by steam locomotives with some early morning services opperated by diesel railcar. The railway is staffed and run by volunteers. 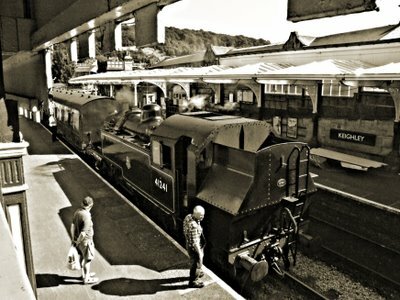 Photographs were taken at the Keighley terminus of the branch. The locomative is British Railways Ivatt Tank No. 41241. Built by British Railways in 1949 the locomotive worked from Bath Green Park and Highbridge on the Somerset and Dorset Line. After a short spell at Leamington Spa the locomotive was sent in 1959 to Wellington in Shropshire working to Crewe and Much Wenlock. It then worked at Bangor, Croes Newydd, Wrexham and Llandudno Junction for the Blaenau branch, finishing it's career at Skipton in 1965 from where it was bought for the KWVR in 1967. 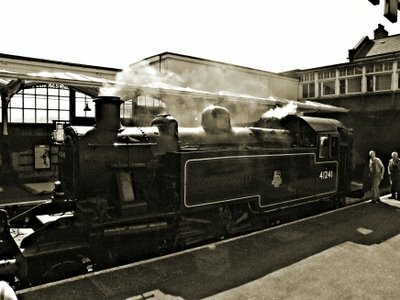 It hauled the train at the re-opening of the KWVR branch in 1968. My goodness - what a history! It's amazing how many "lifetimes" a train line can have, and to think that in some capacity (even in its "retirement") it will probably be around for many more. Thanks for sharing such wonderful history, Keith! wow!! thanks for the history on this, really adds something special to some excellent photography! Thanks for the compliment Daisies. Glad you enjoyed the history as well as the photographs. Alcohol Ink Painting 5”x7” - For sale ORIGINAL - OOAK Please email peggi _meyer_graminski@yahoo.com with any questions. Thank you! Hippy Urban Girl (hug) | "you are poetry"
I am Molly Bloom's soliloquy.